A VALIANT group of fundraisers from Woking and Dorking were honoured with a prestigious award last week. The team were recognised for their efforts in raising more than £6,900 for blood cancer charity Leukaemia & Lymphoma Research at last year’s London Bikeathon. They formed as a tribute to Jamie Butler – or ‘Jim Jam’ as he was known – who tragically passed away from acute myeloid leukaemia in October 2013, aged only 17 months. The seven riders included Jamie’s dad Joe, his grandfather, uncles and family friends. 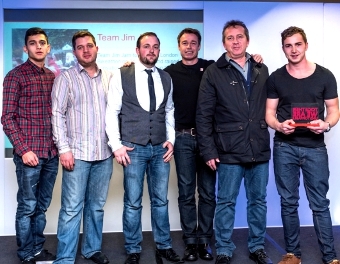 ‘Team Jim Jam’ were presented with the Bikeathon Team of the Year award by ex-England footballer Graeme Le Saux during a ceremony hosted at The Oval cricket ground in London. The charity hold the annual awards evening to celebrate the efforts of fundraisers and supporters in helping to beat blood cancer. Their life-saving work is focused on finding causes, improving diagnosis and treatments, and running ground-breaking clinical trials for all blood cancer patients. The team took on the London Bikeathon last August, which pulled in close to £500,000 for the charity. Jamie’s grandfather Mark said: “We wanted to participate in the London Bikeathon because we didn’t want Jamie’s loss to be in vain. “In his memory, we wanted to actively help the cause that researches into the disease that took him. Hopefully one day more answers and effective cures will be found for all types of blood cancer. Former England and Chelsea footballer Le Saux said: “It was great to be a part of such a wonderful evening, to celebrate the achievements of some truly inspirational people. Team Jim Jam’s determination in helping Leukaemia & Lymphoma Research is evident in the way they pushed themselves to the limit in the event.